Knit were invited to exhibit at Digital Design Weekend at the V&A. A weekend where digital projects take over the Museum showcasing a huge programme of cutting edge, international digital projects alongside performances, talks, open workshops, labs and family-friendly activities – all exploring engineering, making and collaboration. Knit created “Interface”, a Rube Goldberg inspired sequence of interactions that represents the convergence of our physical and digital worlds. Interface uses a variety of technologies such as Kinect, Leap Motion and Heartbeat sensors, to create an interactive experience that explores how these technologies can be engineered to work in harmony through a sequential chain reaction of digital and physical elements. The objective of the installation was to invite museum visitors to interact with technologies that they might not be familiar with and try to complete the sequence. 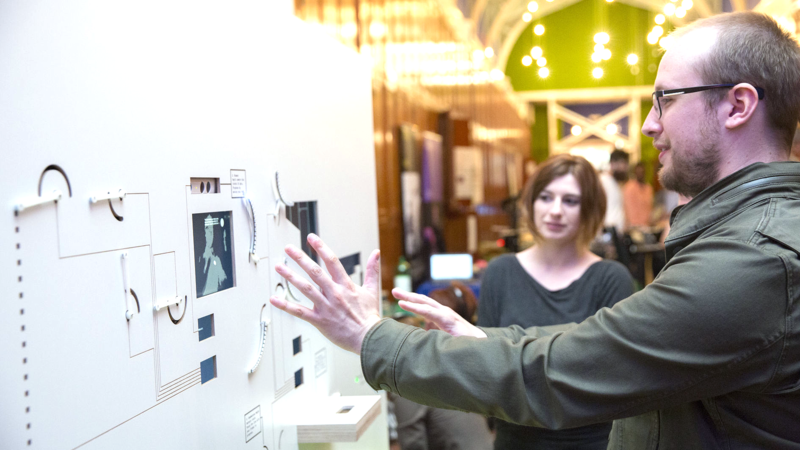 Visitors must interact with an arcade button, Kinect, conductive paint, Leap Motion, an ultrasonic sensor, and a heartbeat sensor. Each presents a challenge that must be completed to progress through the sequence. Interface’s display is both physical and digital using screens, servos and LEDs. Interface is an exploration of these technologies at play and reveals the inner workings, the input data we use, the environmental factors and the data that we collect. A huge number of visitors expressed inquisitiveness and curiosity when presented with unfamiliar technologies as they engaged with the installation. V&A saw a record number of over 24,000 museum goers across the Digital Design Weekend.